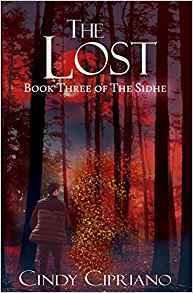 I'm so excited to share the third book in The Sidhe series by Cindy Cipriano! The Lost brings us back to Calum after his harrowing experience with the Void. In this story the characters have grown. They are not the little kids they were in the first book. They've experienced real life challenges and evil which has molded them into the young adults they are becoming. This book answers questions that we've had but it also transitions us into the next step for Calum and his friends. It feels like a transition book and I liked that because some of the things were resolved and new things popped up. You won't be disappointed! I have to say I love this whole series. I can't wait for book 4 to come out because the story is so good. I want to know where the characters are going and how they will end up. The world of the Sidhe that Cipriano creates is so intriguing. It is a place of mystery, wonder and a bit of fear but it makes you want to visit and learn more. My advice is to start with book 1 - The Circle. This is a series you should read in order. Have You Read the Sidhe Series?